On the 4th and 5th September 2014, the Committee on the Rights of the Child considered the combined Second to Fourth Periodic Report of Fiji on the situation of the implementation of the Convention on the Rights of the Child in the country. On this occasion, IBFAN presented an alternative report to inform the CRC Committee on the situation of infant and young child feeding in Fiji. The alternative report showed that 39.8% of infants aged six months or less are exclusively breastfed. Furthermore, a large proportion of children aged 6 months or less are given water (79.6%) as well as sweetened drinks. These data reveal therefore a lack of knowledge about optimal breastfeeding practices. According to the 2011 World Breastfeeding Trends initiative (WBTi) report on Fiji, a national Infant and Young Child Feeding/Breastfeeding policy was adopted by the Government. Such a policy provided a National Breastfeeding Committee that is however now defunct. Moreover, the WBTi report stresses that “Information, Education and Communication” materials are available only in English. The Government of Fiji has fully implemented the International Code of Marketing of Breastmilk Substitutes (the Code) in its entirety. However, an informal monitoring in a supermarket in November 2011 highlighted that complementary food labelling the product as suitable for age 4-6 months has been only partially obscured, which constitutes a violation of the Code. 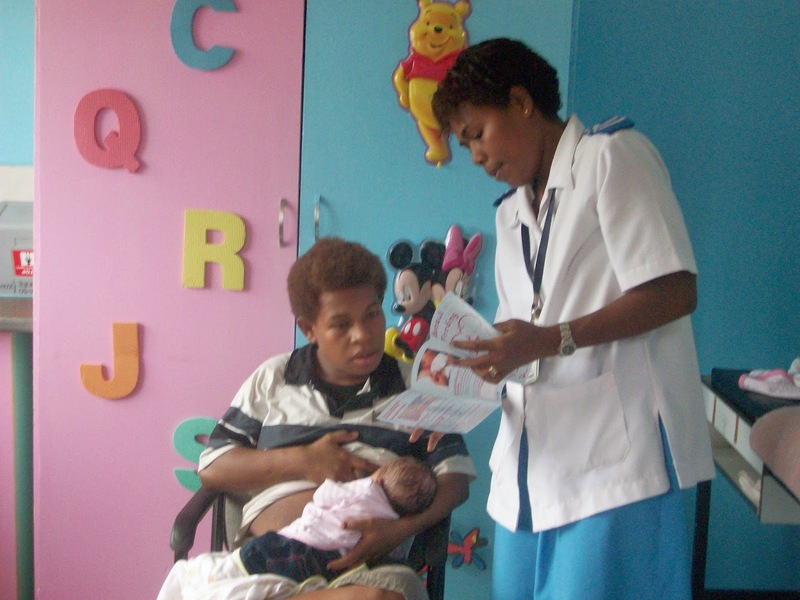 The report highlighted that Fiji has established a national Baby-Friendly Hospital Initiative (BFHI) coordinator. By the beginning of 2009, all its 12 public hospitals were certified as “baby-friendly”. Nevertheless, two main problems have been encountered in its implementation. Firstly, hospitals fail to refresh BFHI courses every two years (as the WHO recommends) and, secondly, mothers are not provided for contacts of health care persons. According to a study conducted by the Fiji Journal of Public Health, 57% of women who do not exclusively breastfeed pinpoint work as the obstacle to exclusively breastfeeding. The Fijian legislation provides indeed only 84 consecutive (12 weeks) days as maternity leave entitlement. For the first three births, such a leave is paid at the normal remuneration rate, whilst from the fourth child, the mother is entitled to only half the normal salary. Additionally, it is worth noting that there are no provisions concerning paid or unpaid breaks during work hours. As far as HIV and infant feeding is concerned, it must be noted that a comprehensive policy on infant and young child feeding that includes infant feeding and HIV is lacking. In coordination with UNICEF and WHO, Fiji developed a flyer on infant feeding during emergencies. However, neither a national plan nor a focus person has been identified to coordinate activities. The Fijian Delegation first stated that the infant mortality rate in Fiji is of 13.7 per 1,000 live births and that perinatal mortality represents an important component of the mortality of children under 5 years old. Regarding maternal health, the Delegation indicated that last year, 4 maternal deaths have been registered in the country. The family health units deal particularly with women’s health, children health (including immunization) and reproductive health as well as with the fight against HIV. The Delegation also indicated that according an immunization state study, the immunization coverage rate is of 84.9%. It further stated that in 2014, collaborative, comprehensive guidelines on child protection aimed at health workers have been issued and that trainings of health professionals on this issue have been organized. Community health trainings are supported by family health units and include training of health professionals on issues related with neonatal intensive care units. The Committee asked how many women breastfeed their child, by emphasizing that breastfeeding ties very closely with child’s health as well as whether the National Breastfeeding Committee is still operational. The Delegation noted that suboptimal breastfeeding practices in Fiji contribute to increase the burden of Non-Communicable Diseases (NCDs). Therefore, breastfeeding and infant and young child feeding are part of the National Strategic Plan for NCDs. The Delegation also indicated that during the first decade of 20th century, Fiji has developed the implementation of the BFHI; during this period, the 3 main hospitals of the countries have been certified as “baby-friendly”. However, there is a current decline in the implementation of the BFHI. The Delegation further emphasized Fiji’s endorsement of the International Code on Marketing of Breastmilk Substitutes and informed the Committee that the National Breastfeeding Committee’s plans to hold a meeting on the 24th September 2014. Finally, the Delegation indicated that “Information, Education and Communication” materials are now available in Ataque language but have not been translated into other languages yet. The Committee expressed further its concern about the current decline of Code implementation. It also highlighted that regular monitoring of the national legislation implementing the Code through an effective monitoring mechanism is crucial. With regard to the implementation of the BFHI and the Ten Steps to successful breastfeeding, the Committee noted that the training of health professionals and the monitoring of these trainings are very important. Finally, the Committee insisted on the importance of monitoring the marketing practices that occur in hospitals in order to make sure that Code policies are followed. In the Concluding Observations, several indirect recommendations were made by the Committee. With regard to the general measures of implementation, it urged Fiji “to take all necessary steps to provide for a timely adoption of [a national comprehensive policy and strategy for children], and to ensure that sufficient human, technical and financial resources are allocated to facilitate its implementation" (§9). It also recommended that Fiji “take all necessary efforts to establish a comprehensive data collection system” (§15). Concerning health issues, the Committee recommended that Fiji “strengthen its efforts to further reduce the under-5 and infant mortality rate, especially by focusing on preventive measures and treatment, including immunization, improved nutrition and sanitary conditions, in particular in remote areas”. It also requested the Government to “enforce its efforts to improve prenatal care and further reduce maternal mortality, including by increasing the training of midwives and ensuring the generalization of specific actions to prevent post-partum bleeding and other major causes of maternal death” (§ 42). Furthermore, the Committee issued direct recommendations related to infant and young child feeding (§54). It recommended that Fiji “ensure that every hospital with a new-born nursery is regularly monitored on adequate implementation of the International Code of Marketing of Breast-milk Substitutes. It also urged Fiji to “raise awareness on the importance of breastfeeding and on the risks of formula feeding” and to “promote proper breastfeeding practices, as well as develop a policy on infant and young child feeding practices, which includes infant feeding and HIV".